Plenty of folks have a quote from a favorite author or a favorite artist's work tattooed on their skin. But what if you could get your favorite artists to design a tattoo especially for you? 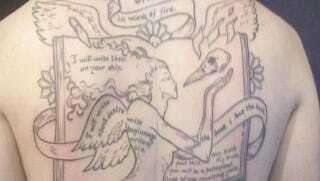 One fan asked Neil Gaiman to write a comic for his back tattoo, and Gaiman agreed. If you like the design but aren't ready to commit to tattooing it on your skin, you can purchase the screenprint for $100, and the proceeds benefit the Comic Book Legal Defense Fund.